Home › sustainable buildings › What is Green Building? In Canada, the Leadership in Energy and Environmental Design (LEED) Green Building Rating System is a system used to encourage the adoption of green building development. The LEED program includes benchmarks for the design, construction and operation of green buildings. It was adapted from the US Green Building Council LEED Green Building Rating System and tailored to the Canadian climates, construction practices and regulations. Examples of sustainable building designs in Ottawa, Canada include the Canadian War Museum and the University of Ottawa’s School of Information Technology (SITE) buildings. 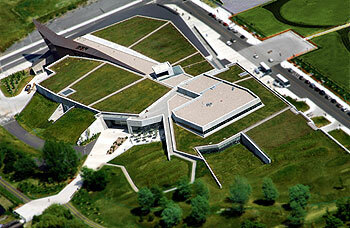 The Canadian War Museum building integrates the use of recycled materials, energy-efficient features and has a green roof. Energy-efficient features include an earth energy system which uses the water from the nearby Ottawa River for cooling in the summer. The water is also used to flush toilets and irrigate outside gardens. The plants on the roof help clean the air of the smog and air pollution. For more details on this sustainable design, click here. The SITE building features an active solar thermal mass heating/cooling system in the precast hollow core concrete floor system. For more information on this project, click here. Few building construction projects adopt the green building approach in Ottawa as, in general, it is more costly than traditional construction. So, what can municipalities do to promote green building? One option is to adjust building permit fees and development charges. Lowering of these costs for sustainable buildings would encourage developers to adopt a green building approach. ‹ Don’t cruise ship companies understand EEE? More costly in the short run – certainly. But the pay back period is generally not too onerous. Municipalities can create a demonstration effect by constructing these buildings themselves, and — as you suggest — they can use taxes/permits/subsidies to send ‘price signals’ to encourage a change of behaviour. Sustainable initiatives are definitively higher initial investment. However, I agree with you that in the long run they pay off. It is my understanding that the Government of Canada currently has grants to encourage entreprises to install solar panels. I’ve heard tha the payback period for this type of installation is approximately 10 years. The City of Ottawa also has a Green Building Policy for the construction of corporate buildings. However, City owned new construction comprises a very small percentage of the total new construction that takes place in the City. What can be done in the architecture and design of housing to achieve a higher EEE is remarkable. Anyhow, from my point of view it is essential that those projects are extensive and readily accessible for the public in order to achieve a significant positive effect towards sustainable living. PassivHaus is a specific construction standard for buildings which have excellent comfort conditions in both winter and summer which can be maintained without any active heating and cooling systems, hence it is called “passive” house. These principles can be applied not only to the residential sector but also to commercial, industrial and public buildings. Even though the concept of passive houses doesn’t seem to be as extraordinary as evignoles’ post ‘home, sweet home …’ it can be easily implemented in our current way of life without making any major concessions. Consequently, the combined end energy consumed by a passive house is therefore less than a quarter of the energy consumed by the average new house in Europe which complies with applicable national energy regulations. The basic principles of a passive house are outlined on this website.